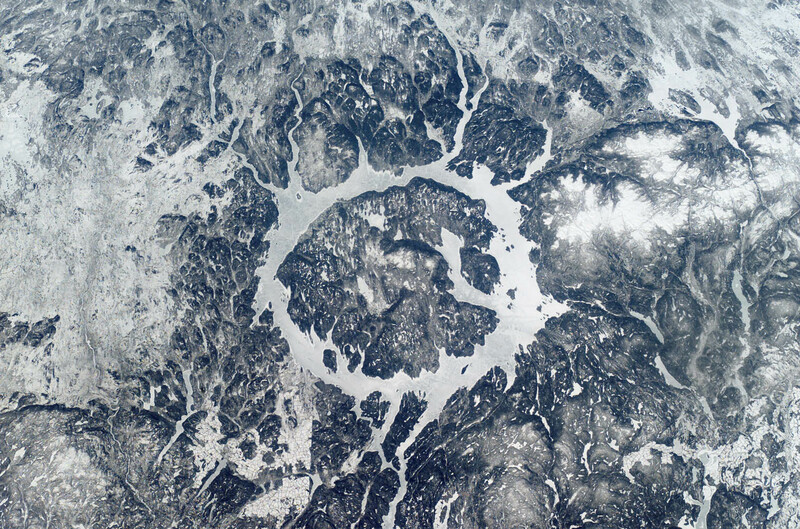 The Manicouagan impact structure is one of the largest impact craters still preserved on the surface of the Earth. This shuttle view shows the prominent 70 kilometers (43 miles) diameter, ice-covered annular lake that fills a ring where impact-brecciated rock has been eroded by glaciation. The lake surrounds the more erosion-resistant melt sheet created by impact into metamorphic and igneous rock types. Shock metamorphic effects are abundant in the target rocks of the crater floor. Although the original rim has been removed, the distribution of shock metamorphic effects and morphological comparisons with other impact structures indicates an original rim diameter of approximately 100 kilometers (62 miles).